The water wheel is not an amusement park ride. Though it surely sounds like it could be. It’s actually a well-known tool in the world of diverse vegetable farming. Over the past couple of days we’ve used it to plant baby onions. Onions. Lots of onions. Thousands of onions. Red onions. Yellow onions. White onions. Sweet onions. Storage onions. We got ‘em all! The weather couldn’t be more perfect for the planting of onions. The soil is soft, cool, and a little moist. The sun is shining. The people are happy—Happy to get the onions planted! 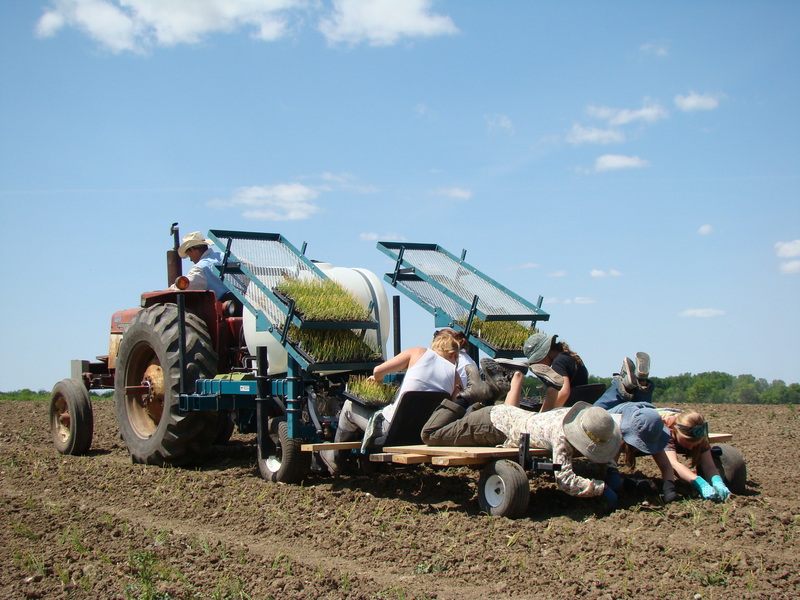 We use a water wheel transplanter to assist us in getting the onions into their new field home. It’s a jumbo tool that attaches to the back of the tractor. This incredible implement has seats for people, shelving for plants, a huge tank for water, and space to put from 1 to 4 water wheels. 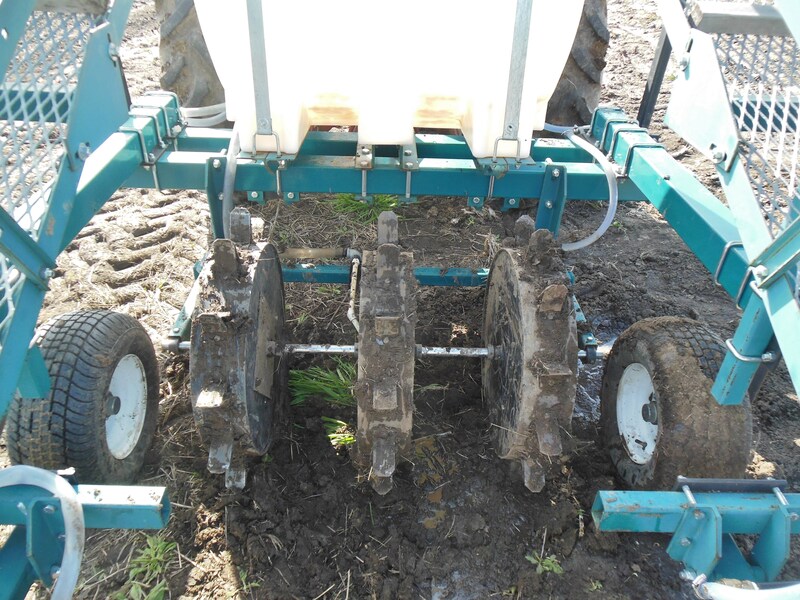 For onion planting we use 3 wheels that are attached to the interior of the transplanter. Don’t think “rubber” when imagining these wheels. These are definitely not rubber, but about 2 foot diameter metal wheels with 2 to 4 inch spikes bolted on. They look like they belong in a dungeon or the weapons room of a medieval castle. Each of these spiky wheels is ground driven— meaning they turn by the force of the wheel pushing off of and into the ground. As the wheels roll across the ground the spikes make holes in the soil for the plants. There are openings in the spikes in which water flows. The water runs through tubing from a 120 gallon water tank attached to the tansplanter. 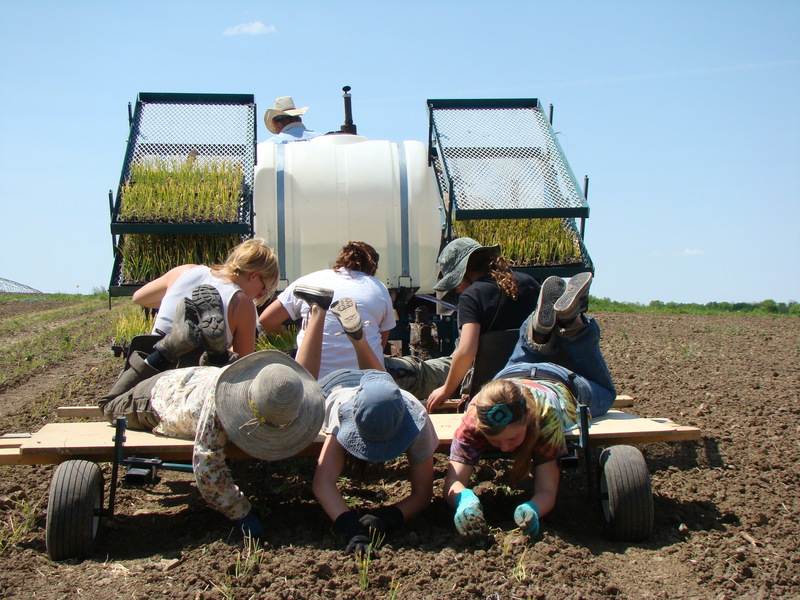 The way we transplant onions with the water wheel transplanter takes a crew of 7 people. 3 people place or drop the onions in the hole that was made by the spikes, 3 people push in and cover the onions with soil, and 1 person drives the tractor (very slowly). The 3 who cover the onions with soil lay down for this job. Having water available at transplanting time as opposed to planting without water means the difference between life or death. Pretty serious stuff. The water that flows into the hole is enough to sustain the young plant until irrigation is placed or it rains – which is often several days. Without the water, the plants are likely to bake and wilt in the hot sun. Onions are pretty tough. They would likely have a higher survival rate than most leafy plants if they didn’t get that squirt of water from the water wheel transplanter. But why take the chance? I’d prefer no casualties in the onion patch. 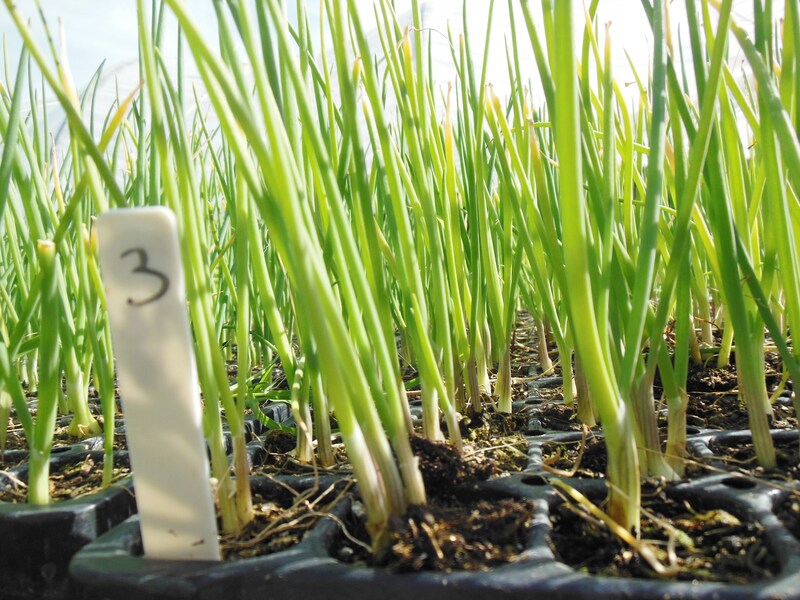 The water ensures that most plants don’t perish, helps the little onions deal better with transplant shock, thus maintaining steady growth. 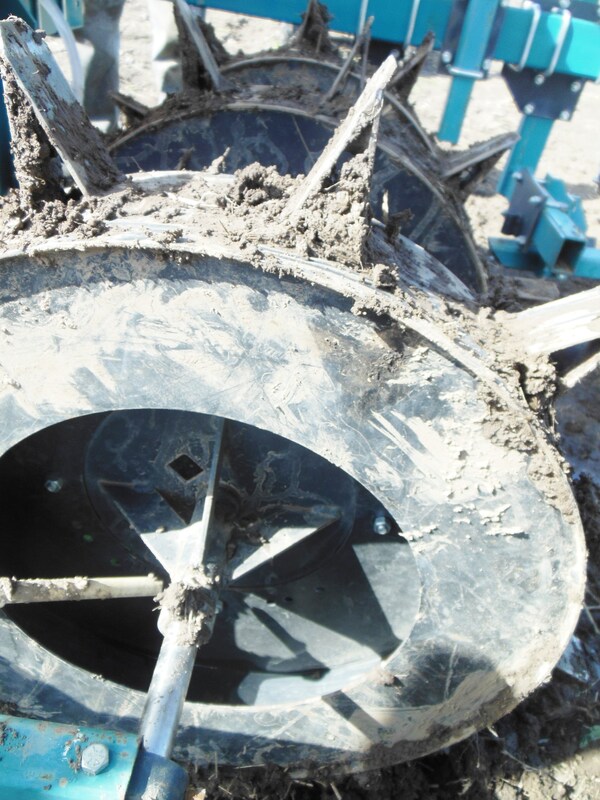 We use the water wheel transplanter for transplanting most of the plants we grow in the greenhouse. Plants like onions, broccoli, beets, cabbage, tomatoes, peppers, celery, melons, cucumbers, squash, and the list goes on! It is truly a great tool. And, like an amusement park ride, it’s certainly fun to work on, too. Click on any picture in the gallery below for a slideshow.